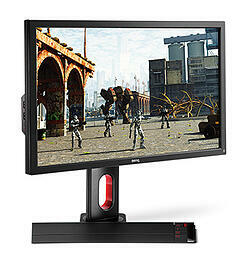 The belief behind our gaming monitors is simple. Deliver market-first features that give you, the gamer, an opportunity to edge out your opponents. That's why we design all of our gaming products in close collaboration with professional gamers. Using behind-the-scenes input, testing, and feedback, our engineers are able to develop significant innovations that create amazing onscreen experiences for all gaming enthusiasts and pro gamers. With the release of our new XL-Z Series, we pushed the limits of performance once again by becoming the first major brand to provide blur reduction technology on our monitors. Using this technique, blurring effects are dramatically reduced on the majority of the screen to provide a smoother game play. This doesn't mean that ghosting and/or crosstalk have been entirely eliminated (low levels can still occur), but you will notice a substantial improvement in the way action moves across your screen. Last year, we tested our blur reduction breakthrough with several professional gamers and at high profile events, and the response was so enthusiastically positive, that we decided to include the feature on our entire line of XL Series monitors. Thanks to your valued feedback, we're releasing a firmware update for our current XL-Z Series monitors to enable the use of select BenQ-authorized third party optimization utilities. The new Blur Busters Strobe Utility for our XL-Z Series monitors – which is available now – enables the optimization of our XL-Z Series monitor's blur reduction settings to allow you to customize it according to your own personal gaming preferences. Although our monitors are already optimized for high speed gaming, this optional utility lets you personalize the monitor's blur reduction settings even further. Yet again, BenQ is first-to-market with this type of capability, and we're excited to offer you flexible options to achieve the best possible gaming experience. For gamers/users with XL-Z Series monitors who would like to further customize their blur reduction functions beyond factory settings, BenQ America Corp. will provide an optional free service update to install the new firmware – you only have to pay the shipping to our service center. Download the XL-Z Series Gaming Monitor Firmware Update document (PDF - 386kb) and follow the three simple steps to return your unit. If you have any questions or need additional support, please don’t hesitate to contact the BenQ America Corp. support team at 1.866.600.2367.